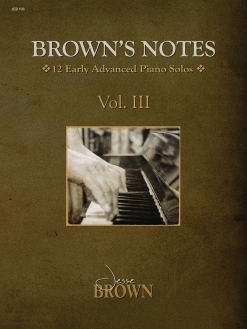 Brown’s Notes, Volume 2 is the second in a series of three books (so far) composed and selected for a specific level of piano student or pianist. A longtime piano teacher himself, Jesse Brown’s studio, cleverly called Music’scool, must be a happy place indeed! 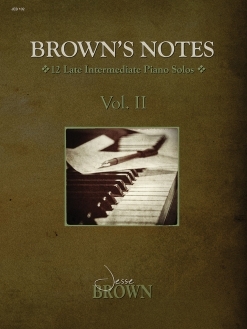 The twelve piano solos in this book are geared toward pianists at a late intermediate playing level and present a variety of music situations not often encountered in most graded teaching materials. I love the variety of styles and genres in these books, and this one includes an original hymn, blues, rock, “new agey,” ragtime, semi-classical styles and more. Several have swing rhythms, two are in Eb minor (yikes! Six flats! ), and all have colorful, descriptive playing instructions. One lovely ballad is marked “Passionately,” and I think most piano teachers encounter situations where students play with very little expression. Here is a great opportunity to talk about that and then put it to use: i.e “What does it mean to play passionately? What can you do to make the piece feel emotional?” etc. Some of the rhythms are a bit tricky and it is necessary to count them to play them correctly. When the music is fun and sounds good, students are more likely to knuckle down and try to get them right. I’ve been teaching piano for 37 years and am very excited about this series of songbooks! 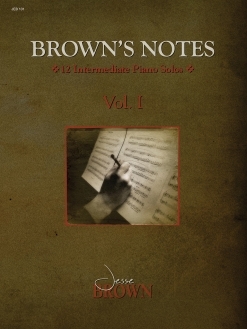 Jesse Brown has recorded several albums of his own music, which I love, and I think it’s great that he is sharing his talents with piano students and advancing pianists - hopefully all over the world! 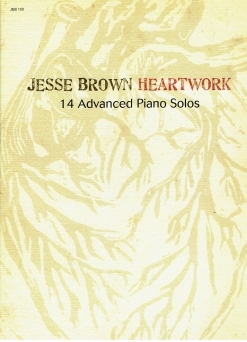 The songbooks are available from Jesse Brown’s website and Debra Wanless Music. Very highly recommended!